Yes, I am posting this recipe because I couldn’t wait any longer. I had a teaser for this post on Instagram last week and didn’t plan to post it for another week and a half. But I just couldn’t wait any longer to share it! Tomorrow is the start of Brunchweek where I will be teaming up with some great bloggers and awesome companies to bring you a chance to win one of TWENTY different prizes. We have a whole weeks worth of awesome Brunch-type recipes and so I already have all of my recipes ready to go for next week. And healthy brownies, as awesome as these are, didn’t really fit into a brunch category. In my mind that is. So yes. I bet you are wondering what exactly are in these brownies? Let me just start by saying again – no vegetables. And NO black beans! 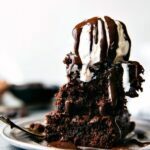 Have you all tried black bean brownies? I have a few times actually. And while they are pretty good, it’s still a little hard for me to get on board with. I mean beans in dessert? It’s just a little weird still… for me that is. So I’ve been trying to create brownies that are healthy, don’t taste like cardboard, and don’t have weird vegetables in them. It has not been the easiest task and there have definitely been many fails along the way. These are super simple and so chocolate-y good. The secret ingredient that makes them creamy and irresistibly rich? That would be peanut butter and applesauce. Which neither have a very prominent taste in these brownies. My husband couldn’t pick out either ingredient. One last thing – these call for oat flour. That is just regular oats that have been ground up until they reach a flour consistency. Make sure to measure the oat flour AFTER grinding the oats and not before. To ensure these brownies are gluten-free, make sure your oats specify that they are certified gluten-free. And they were both SO GOOD!! 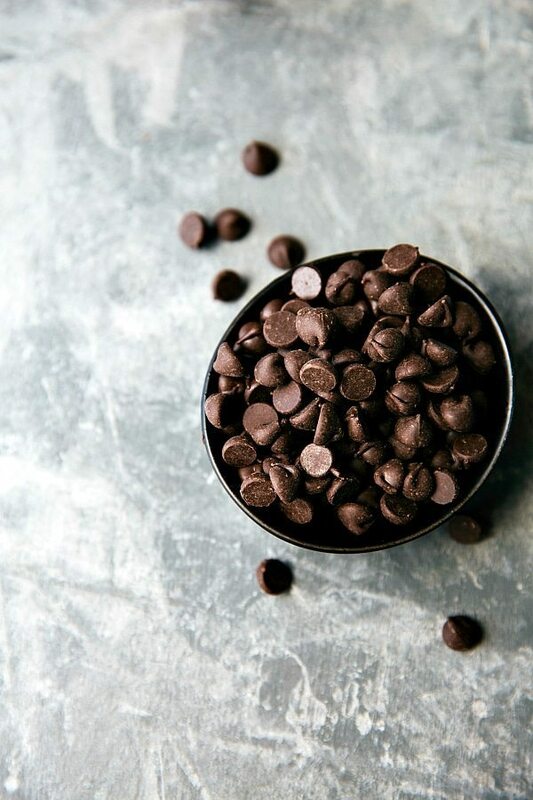 I’m always looking for creative ways to get my chocolate fix; about to mix up a batch of these “no bean” babies, can’t wait to see how they turn out!! These look so moist and fudgy! I laughed when I read “No beans!” in your title. I’m with you – sometimes, it is just a little weird to put beans in dessert! Pinning these! I was so excited to see “no beans” in the title of these! Now these are some healthy brownies that I’m actually going to try! 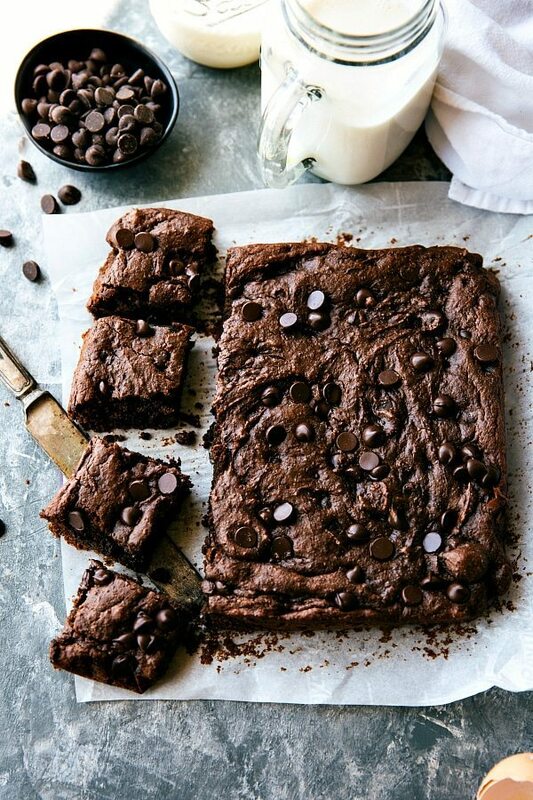 Couldn’t wait to see how you made these delish looking brownies! Yes, skinny without weird! 😉 I’m always looking for new ways to use oat flour. My last brownies with oat flour, I didn’t grind them well enough … my family let me know that was not okay haha! I need to get some more applesauce! These are incredible, Chelsea. 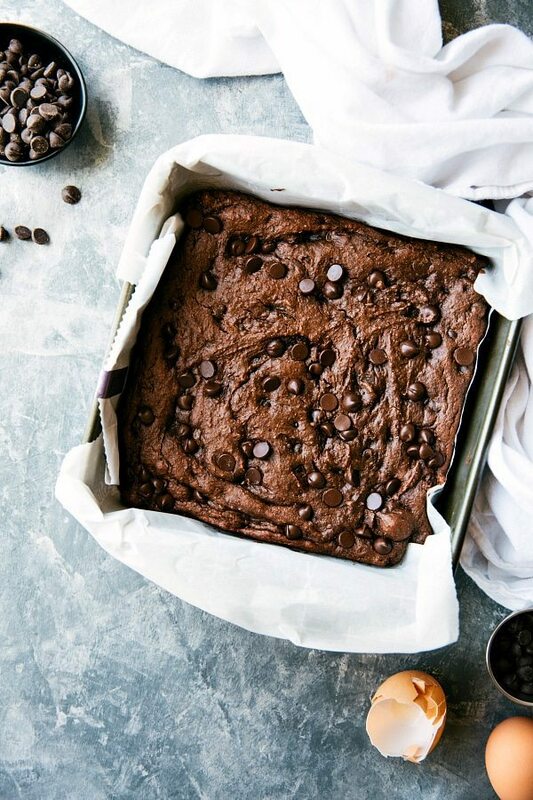 You nailed everything a brownie should be while still keeping it healthy! Black bean brownies are amazing!!! Weird vegetables…that is funny. Woot, woot!! Brownies that aren`t too horrible for your body! 😀 Thanks for the perseverance, to create this beauty! I am SO in love with this recipe! You’ve totally solved a problem for me. I’ve been looking for a good fudgy better brownie and I never thought to use PB!! These are totally getting made for the husband! I’ll just have to settle for echoing everyone else’s accolade: peanut butter and applesauce are wonderful ideas for making these brownies both healthy and delish! Fortunately, I have just half a jar of applesauce left and look forward to whipping these up very soon. Thanks for sharing! You did say that since these were healthy, we could have them for breakfast and brunch, right??!! You are my hero, hahaha. Seriously, these look so moist and fudgy! Haha I can see why you’d want to avoid black beans in a healthy brownie. When I’ve made them, I could always detect a slight beany taste. These look amazing, though, and I love the addition of peanut butter! I just can’t bring myself to do beans in brownies. I think it will take me a lonnnnnnng time to jump on that bandwagon, but I love what you have done with this recipe! I love applesauce as a wet ingredient in brownies and these look too good not to try! Pinned! I’m with you – as good as black bean brownies may be, it’s just…weird. Love your creation, and they do look perfectly fudgy! Ha! I love your disclaimer about “no weird veggies” 🙂 These look SO GOOD!!!! I can’t believe they are so healthy too, they look amazing!!!! YOU ARE A COMPLETE AND UTTER GEEEENIUS!!!! Pinning and totally making these! These are amazing, made them tonight and they hit that chocolate craving. Made these using natural peanut butter and worked out great. Delicious! I loved them, kids loved them and I am sure if there are any left tonight, my husband will love them too! just made these brownies for breakfast – they were so good! thanks so much for the great recipe. These look wonderful! Have you tried them using an egg substitute? Sorry, I haven’t tried these with an egg substitute. If you do try them and they are a success, I would love to hear about it! Can you say “YUMMY”? Just made these tonight. Was a little short on peanut butter so I finished off the 1/2c with almond butter. Also added sliced almonds for crunch. They turned out so gooey and good we could have eaten the whole pan! I will be making these from now on as my “go-to” brownie recipe. Delicious! Thanks so much for taking the time to comment!! So glad you loved them – and I love all the additions/changes – definitely adding sliced almonds next time because that sounds awesome! 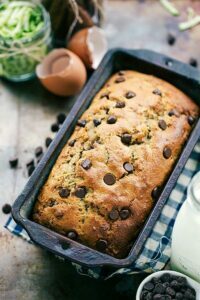 I’ve tried some of your other oat flour recipes ( pumpkin and chocolate and they were wonderful ) do you know if these can be frozen ? Thank you. Thanks Sandy! I’m not sure since I’ve never tried freezing these, but I’ve had a few readers freeze muffins with great results so I don’t see why not! Simply the best! I had to change peanut butter with sunbutter and since I didn’t have applesauce I used pumpkin! Oh my gosh they were so good! Thank you! OMG! These are amazing!!! I made them lastnight and I loveee them. I’m a chocolate/pb fanatic but I’m trying to watch my sugar so I only used 1tsp of brown sugar and 1 tbsp honey and they were perfect. I keep them in the fridge and they’re even better the next day…with coffee. 🙂 Go to town on these, they’re worth it. Just wondering, are the oats quick oats or long cooking oats? Can’t wait to bake these. Thank you! We diabetics appreciate your dedication. Just made these and felt compelled to leave a comment because they are SO DELICIOUS! Thank you so much for sharing this recipe! It will be my new go to brownie recipe too! AWESOME RECIPE! What is the fat grams and calorie count? OMG! Made these last week and were awesome, fudgy and delicious! I’m making them tomorrow again! Could I use wheat flour instead? 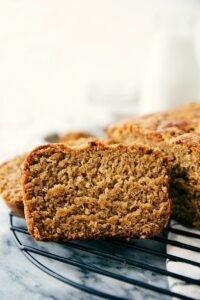 I tried these with whole wheat flour and they turned out perfectly! They are so incredibly delicious! I have to try and stop myself from eating the whole pan now! Definitely a keeper! Omg these brownies were SOO GOOD I had to make a review right away. 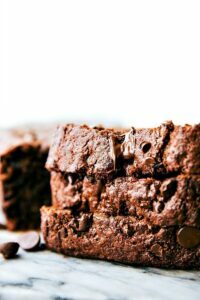 They are the softest most gooey brownies ever, not to mention they’re HEALTHY!! The only difference I made was used 3 tbsp white chocolate chips because I was set on making a healthy brownie & the 1/2 + 1/4 cup that the recipe calls for was just a big no. It tasted great with the minimal amount of chocolate chips but if you’re not used to eating healthy you can keep the amount written. Also, when I was mixing the peanut butter it wasn’t turning into a liquid consistency because I don’t have an electric beater, so I just popped it in the microwave after I put the applesauce and that did the trick. Will only make this recipe from now on, YUM!!! 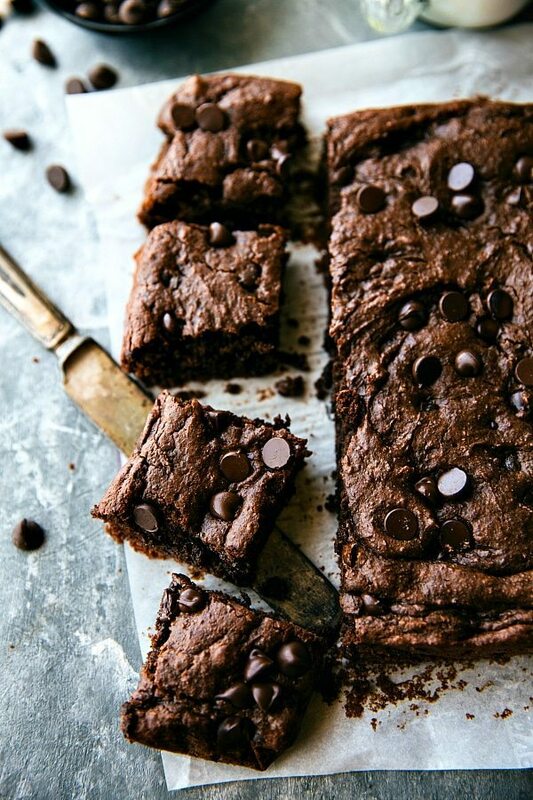 Seriously one of the best brownie recipes on the planet! And those photos … wow! 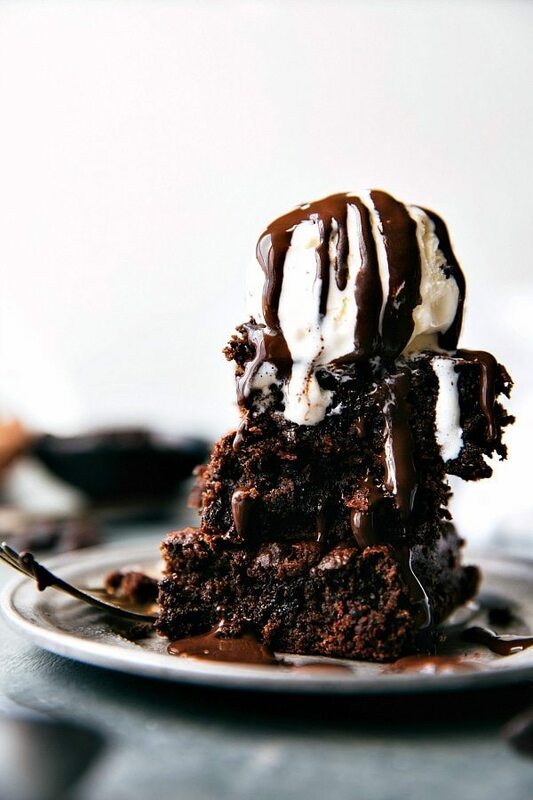 These brownies look so fudgy and moist! I plan to bake them with Lily’s dark chocolate, to bring down the sugar content a little more. Thank you & I meant how pleased we were. Amazing!!! These look amazing!! I’m always looking for ways to make my favorite sweet treats healthier! could you use powered peanut butter as a substitute for creamy peanut butter? has anyone tried it? Thanks!! Thanks Emmy! I absolutely know for this recipe you can’t use powdered peanut butter as a substitute. Sorry, these just won’t work out without real peanut butter. I was not sure about the Flourless Applesause Brownies but still very excited to make them. My husband & I were shocked at hoe Delicious these brownies actually are. Very plesantly surprised. Id rated this recipe 5 stars. Thx Carole L. Cleveland Oh I meant how great these are. This recipe is now my go to recipe. I substituted the egg for egg substitute, the brown sugar for splenda and the peanut butter for powdered peanut butter. I also only used 1/2 cup of chocolate chips and they turned out fudgy and delicious. I plugged the recipe in with my substitutions and for 1/9 th of the recipe it was obly 114 calories! Best brownie recipe! I’m so happy you’ve enjoyed these brownies Amal! 🙂 Thank you so much for the comment and sharing your substitutions! I love this recipe! I made a batch. ..they didn’t last long…I will make another one soon!! These were so good!! I subbed out vanilla with maple syrup and used half natural and half skippy PB and the brownies still turned out amazing!!! (I even did them in cupcake liners with a cooking time adjustment!) They were super chocolatey and delicious and MAYBE a bit underbaked but once cooled they were the most fudgey brownies I have ever had! Thank you so much for the recipe! Hi! Is there a substitute for the applesauce? Mashed banana perhaps? If I did used banana in these would they taste like banana do you think? Thanks in advance!? If you use banana, I think these would definitely have a strong banana taste. What about trying pumpkin? I used natural peanut butter and it worked perfectly! These turned out great! I made these on Monday, and finished the pan by Tuesday. By myself, my husband barely got any…But these were incredible!! and not “healthy” tasting, even my husband agreed! (He’s often suspicious of the ingredients used in my healthy baking attempts lol!) Also, I didn’t have any eggs on hand so I substituted a third of a banana (mashed) and these came out beautifully. I will totally be making these again! THANK YOU!!! Wow!! I have been on the hunt for a healthier FUDGY brownie all week. I’ve been making numerous batches a week and none of them were the fudgy consistency I wanted. They were cakey. THESE BROWNIES WERE FUDGY AND DELICIOUS. I was very skeptical after the many recipes I tried, but these were the best. I could’ve ground my oats a bit better, but they were still really really good. These are going to be my go-to brownie recipe! Thank you so much! YAY!! Love hearing that! I’m so glad these were a hit 🙂 Thanks for the comment Jade! Oh my gosh I’m dying! These are SO GOOD!!!!! Just had my first piece & I have a feeling there will be many many more. My oven is weird so I had these in for 25 mins & they are absolutely perfect. SO fudgy. You nailed this one!! Can you use unsweetened cocoa powder? These look delicious! I CANNOT TELL YOU HOW GOOD THESE ARE!!! Literally the best brownies I have ever had!!! The whole batch was gone by the end of the night! Not used to healthier desserts so I used 3 and 1/2 TBSP of brown sugar but they were delicious!!! Definitely will make instead of processed garbage brownies! These brownies are THE. BEST!!!!! I was just wondering if you could make the batter ahead of time and put it in the fridge? I want to make some tomorrow but I would need to make them ahead of time to do so! !